Introducing Charm FOBs! A Brand New Edition for 2018! Have You Met Our New Charm FOBS? How many times have you lost track of your keys? You insist you’ve tossed them in the bowl near the door but now they have gone missing? Or perhaps they have become lost in the bottom of your bag throughout the hustle and bustle of the day. No matter how you slice it, there are many ways to lose track of our keys. Luckily we have a charming and eye-catching way to hopefully fix this problem: Charm FOBs. Charm FOBs are a fun, trendy way to organize your keys. Plus they are a brand new offering from Charity Charms! They are an engaging and useful gift for your supporters. 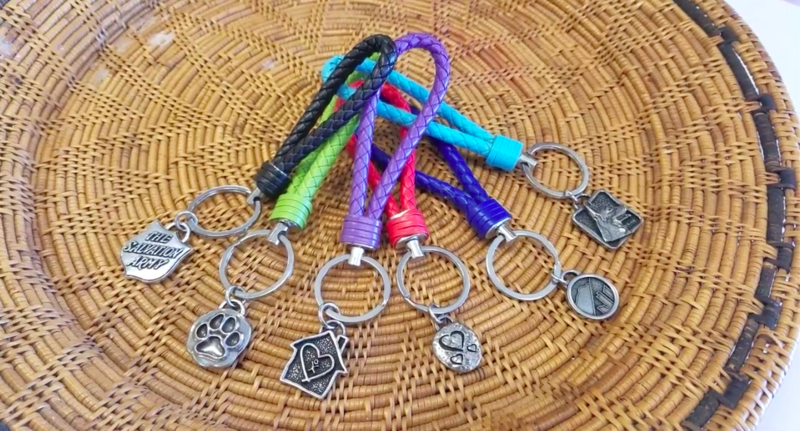 Charm Fobs features a versatile loop made of animal-friendly pleather. This loop comes in many colors for you to choose from making it easy to match your brand. Attached to the loop is a pewter FOB with 22mm BIG charms that feature your logo. Charm FOBs are created from your logo making them great donor recognition gifts and membership incentives. Use them to raise funds for your cause. They are also perfect for promoting employee engagement within your organization. These FOBs make wonderful swag gifts for your event or seasonal gala. The possibilities are endless, and no matter what you use them for, the recipient will have a useful item to remember you buy. FOBs aren’t your typical keyring which allows your organization to showcase a little personality and style. You create the look of the FOB right down to the colors and packaging. Your supporters and employees will have a piece of you daily. This helps to not only build a community but spread your message further. No matter what your organization, Charm FOBs can elevate your marketing, increase awareness and engagement. Watch the short video below to learn more about Charm FOBs! Learn more about Charm FOBs, view pricing and packages, or get a custom quote below.